In this review of the Rumparooz G2 pocket diaper, learn more about why we love this one-size pocket when you're starting out from birth, plus what we would change about it. We think this is one of the best one-size fits newborn, poopslosion-containing cloth diapers on the market. Approximately how much did you pay for it? - $22 for snaps, including one microfiber 6r soaker! 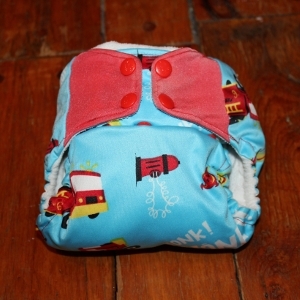 The Rumparooz is a great pocket diaper. We've tried a lot of diapers out, and this is one of the few one-sizes that truly does fit at the newborn stage. Not only does it fit at the newborn stage, it also works at the newborn stage, thanks in large part to the dual inner gussets that contain leaks from around the legs, and a unique gusset at the back of the diaper that stops those up-the-back blow-outs that are bound to try to happen at some point or another with your newborn. Cloth diapers are generally much better at containing blow-outs than disposables, but the Rumparooz is definitely one of the best for this. 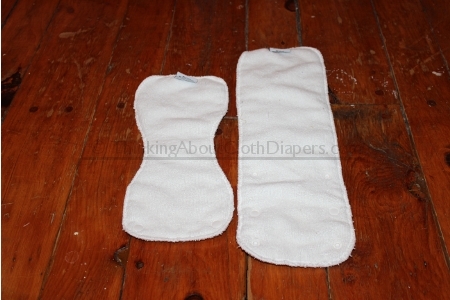 With the gusset at the back, we never once had an experience where the blow-outs even reached the very upper edge of the back of the diaper, so we didn't have to worry about carefully removing the diaper. Kanga Care, the manufacturer of Rumparooz, is based in Colorado, and makes all of their diapers in the US. They are extremely conscious of the environment, and as a result, the outer fabric used in the Rumparooz is TPU, rather than the more commonly used PUL outer. From the Kanga Care website: "Biodegradable TPU is solvent-free. Biodegradable TPU is a polyester fabric that has been laminated with a thermoplastic polyurethane using a heat bonding process, not chemicals. This process is low in toxicity and is better for the natural environment then traditional PUL. Both the TPU laminate and the polyester fabric the laminate is applied to are biodegradable. When composted they will biodegrade in 4-5 years." What we love about Kanga Care's TPU is that it's easier to stuff, since it doesn't feel as sticky, and it holds up really well. This Rumparooz diaper has been used for about 3 years, and you can see from the image below that it's still in perfect shape. After 3 years of use, the TPU inside this Rumparooz is still in great shape. Rumparooz diapers are made in China, but I love that they have very strict ethics in place in their production facility. Here's a letter that their CEO wrote to the cloth diaper community that details why they chose to make their diapers outside of the USA and how they ensure that their staff are paid a fair salary. This is a nice, trim diapering option. 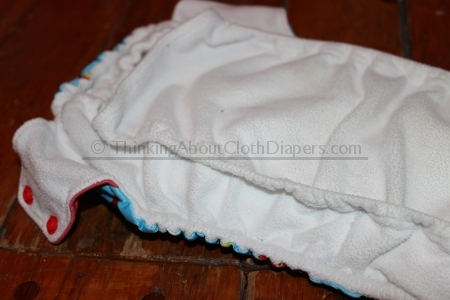 Each diaper includes a microfiber insert called the 6r soaker. The insert is made up of two pieces that snap together, and has adjustments so you can customize where you have the absorbency, and also the length of the insert. Each of the two pieces is made of 3 layers of microfiber, which makes for a lot of absorbency. The Rumparooz has a wide pocket opening, making it super easy to stuff, too! In addition to microfiber, Kanga Care also offers 2 other fabric options for the 6r soaker (bamboo, and - my favorite - hemp! ), but upgraded inserts must be purchased separately. The upgraded inserts are cut in the same shape as the microfiber 6r soaker, but each include a total of 7 layers of fabric. Another great thing we love about Rumparooz is the variety of prints available. With many companies, the prints offered are only gender specific, but Kanga Care offers lots of gender neutral prints as well as ones for boys and girls. Our favorite boy option is "Ladder", and I love both "Kangaroos" and "Gumballs" prints for gender neutral options. While it wasn't an option when I bought my first Rumparooz diaper, they are now available in both snap and Aplix closures. I'm generally not a fan of hook and loop closures because they tend to wear out quicker and can be messy to deal with (plus, our pet ferret used to love to chew on them, making a mess of the "loop" side). Rumparooz, however, spent 18 months perfecting their hook and loop closure, working with the top manufacturer of hook and loop - Aplix - to make sure that it could hold up to the rigours of diaper laundry. After reading more about Aplix on Rumparooz website, I can't wait to try one of these diapers in the future! This diaper fits on the small side. As I mentioned, it truly does fit a full-term newborn, but I didn't find that it fit all the way up to 35 lbs. I had no problem with the waist adjustments, but this diaper made for a "low rider" style on my tall little boy - by the time we got to the largest setting, I didn't think the rise in this diaper compared to some of my diapers from other brands. Yes, on a scale of 1 to 4 (with 1 being never, and 4 being absolutely! ), I give the Rumparooz G2 a 3. I love that it fits small babies and the reliability is awesome! 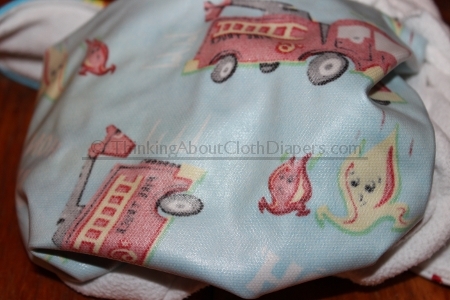 That said, if you're starting diapering later on, you may not need the gusset technology as much and you might not get to use this diaper right until the end if your child potty trains late. The only downside I found with this diaper is that the rise is short, so we stopped using it before we got to the 35 lb mark - I just had others that fit better at the later stages. I would love to see a slightly longer rise on this diaper. I don't think it would have a huge impact on the ability to size this diaper down, but it would give us a slightly longer window to use the diaper later on. Diaper Safari carries a wide variety of Rumparooz diapers, and offers free shipping in the US with no minimum order. Rumparooz Aplix are currently on 25% off! For Canadians, we have had a great experience ordering from Nature Bumz! Plus, Nurtured Family in Texas currently has the 6r soakers on half price! Janie, Quebec, Canada. Purchased 2012, $18.99, used 6 months. What do you love about this diaper? I love that its all in one and love the prints as well. Carrie, Colorado, USA. Purchased 2012, $25, used 6 months. What do you love about this diaper? I love the inner gussets. They offer so much protection against ebf poo. What would you change about this diaper? The rise is a little short compared to other diapers. I'm not sure we will be able to use it to it's full weight limit. Disclosure: The opinions expressed in this post are entirely my own, and your experience with the product may differ from mine. I only recommend products or services I use personally and believe will be good for my readers. I did not receive any form of compensation or free product from Kanga Care. This article does contain affiliate links. I am disclosing this in accordance with the Federal Trade Commission’s 16 CFR, Part 255: “Guides Concerning the Use of Endorsements and Testimonials in Advertising.” For more information, see our Disclaimer and Copyright.